I wrote this post one year at Valentine’s Day when Q was still in preschool. At the time we were still doing injections and practiced a tight eating schedule. Now that we have an insulin pump, she can indulge a little more at parties. But big bowls of candy are still off limits. The preschool had a Valentine Disco Dance earlier this week. This is our third one and I knew the drill. Luckily most parents are opting to bring somewhat healthy snacks like veggies and cheese and crackers. The dance is from six to eight in the evening, which forces us to break from our schedule. Dinner had to come a little early and anything consumed at the party would be outside of our normal snacking guidelines. Not a big deal for any normal kid, but for a diabetic child changes in normal eating times and snacking outside of normal parameters can cause wild swings in blood glucose levels. I did what I could, serving dinner as close to our departure time as I could. I gave the little pep talk about choosing the veggies and cheese if she gets hungry while we are there. And I promised that we could bring something home. I packed two empty containers in the bag we take everywhere we go. You see, cupcake decorating is one of the big activities at the party. My daughter decorated a cupcake, topping it with layers of sugary icing and sparkling sprinkles. The other children licked icing-covered fingers and opened their mouths wide to sample their delicacies. With a positive voice I told my daughter how yummy her cupcake looked and helped her put it in our container for later. She headed to the snack table and loaded a plate with veggies and cheese. She asked if she could have some apple slices, strawberries, and crackers. I let her indulge in two apple slices, one strawberry, and two crackers. I knew that with all the running around and dancing that she was expending energy and the small amount of carbs would keep her from dipping. But a cupcake would have sent her over the edge causing a crazy high that would take days to even out from. At bedtime that night she asked for the sugary cupcake we brought home. I said perhaps she could have it the next day with a meal. And in all honesty, three days later it still sits in the refrigerator, untouched and forgotten. And this is what we do, what we have done even before the diagnosis of Type 1 diabetes. We limit the bad stuff and encourage the good. And the bad stuff is quickly forgotten. We find stashes of Halloween candy in the high cabinet as we make room for Easter treats. We remove bags of candy from our home, tempting coworkers or stashing them in desk drawers. But it has to be difficult for a four-year-old to not only be tempted time after time with forbidden fruit, but to have the understanding that the answer is no. She is a normal preschool girl. You wouldn’t be able to tell her from the others on the playground, or at dance class, or at the library. But unfortunately food, bad-for-you-food, is so strongly entrenched in how our society celebrates. Name any holiday and there is a traditional food-centric activity or indulgence. Today they celebrated Valentine’s Day at school with the traditional card exchange. Valentine’s cards don’t have carbs, you say. Oh yes they do! Because attached to the cards are suckers and smarties and chocolates and heart-shaped sugar, sugar, sugar. Refined sugar that sends glucose levels skyrocketing. And even if I let her indulge in one of the treats, individually-wrapped candy rarely has nutritional information and carb counts would be a guess. So as she pleaded at lunchtime today and again at dinner for just one, please just one, lollipop, I went to the stash of sugar-free lollipops and talked her into one of those instead. But they are not special. They are not Valentine’s. They are not heart-shaped. They are not special gifts from her friends. We gave out Play-doh, which we have done every year, even before her diagnosis. 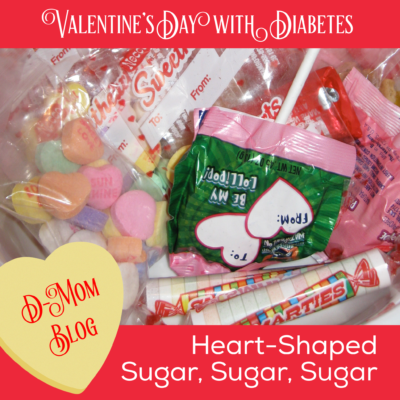 In return she received a huge bowl of temptation, being denied, and confirmation to her four-year-old self that she is diabetic and different. In all honesty, she constantly amazes me with her understanding. She proudly tells me when an injection didn’t hurt or only grits her teeth and crinkles her nose when I know it burns and pinches. She is able to take no for an answer, when she has every four-year-old right to throw a fit in protest. And she will get through this holiday, not once questioning “why me, why am I diabetic?” Instead focused on her meticulous plans for giving to those she cares about. Frances- Sometimes I think us parents internalize things more than our children do. Mostly because we want to protect them. We had our party earlier this week. She was so busy dancing & playing with her friends that she didn’t pay much attention to the food. She had some heart-shaped cheese and lots of veggies with dip. Toward the end of the night she decorated a heart-shaped cookie with icing and pink and red sprinkles. We brought it home and she had it at snack time the next day. She didn’t question it. I would have let her eat it right then and given a bolus through her pump, but she didn’t even ask. I’m with you–a year later and I’m much more confident and knowledgeable and I know how to handle parties a little better. And so does she. great post! we are about to handle our 1st Valentines Day. They are having a party at school tomorrow and we told her to bring all her goodies home with her and she can then trade her stuff in for a trip to the toy store and she’s ok with that. And I did find some some treats for 15g of carb so that will be her treat. We have two boxes of “treats” at school for her. They are both 100-calorie packs and have 15gC. One is Oreo Cakesters. I’m not claiming that they are healthy or something I would serve her ALL the time, but they are special for her and she doesn’t feel left out. When there is a birthday celebration (which seems to be every week), she can choose between her two special snacks.